List of 64 news stories. 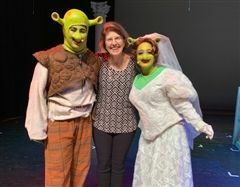 Alums Shine in Shrek Jr.
JCDS alums shined in the recent Bolles' production of Shrek Jr., The Musical. Nitin Davuluri ('16) and Aisha Hassan ('17) played the lead roles of Shrek and Fiona. 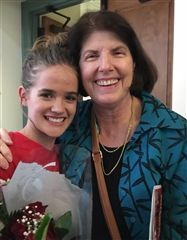 "They both sang and acted with such ease and confidence, it was such a thrill to see them perform," Virginia Dickert, Music Specialist, said. Why Is Sharky Wearing A Hardhat? It is with great enthusiasm and a vision for the future that we announce the JCDS Next Generation Renovation Project. Following over a year of extensive research, the Board of Trustees and school administration have approved a plan for the modernization of the Main Building. How much attention do students at your children’s school get from their teachers? Class size and student-to-teacher ratio are important considerations when evaluating the effectiveness of your children’s education. Nurturing minds and building character are the key guiding principles of Jacksonville Country Day School. They are foundational. Each day teachers and staff build upon them. 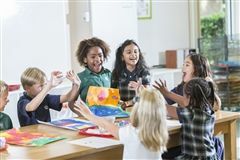 Challenging curricula, targeted coursework, and diverse activities —as well as differentiated classroom techniques and technologies — all positively impact developmental growth. The importance and benefits of being physically active are well known. Active people tend to be healthier, live longer, and have a lower risk of cardiovascular disease. The foundation for a physically active lifestyle is laid in childhood. And because children spend so much time in school, schools provide the perfect environment and offer a unique opportunity to get kids “moving” in the right direction. “In my line of work, I listen to and speak frequently about shared values and how we can orient around what we have in common versus what divides us. Over the years I have thought a great deal about why collaborative leadership and service mean so much to me. My answer came to me in two parts. It’s my family’s values and the Character Education program at JCDS that has been the basis for why I have been involved with interfaith cooperation, AmeriCorps, and other initiatives. After a successful week transitioning back to school, our students are happy to return, happy to be in their routines, and happy to be learning. A quote from 1st grade Lead Teacher Kate Krawiec about creating a positive classroom culture was featured in the December e-newsletter from the 7 Mindsets. JCDS students presented their makerspace projects at the Convergence Neuroscience Conference, which was sponsored by Mayo Clinic. The ten 4th grade students discussed and demonstrated the prototypes they had designed and built in the school’s makerspace to help astronauts on long space voyages to Mars cope with homesickness. 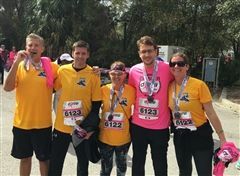 Paul Fouts made a significant contribution of time and effort to benefit the students of the elementary school he attended, Jacksonville Country Day School. For his Eagle Scout project, Paul built raised wooden gardening beds for the use of the Pre-K and Kindergarten outdoor science programs at JCDS. Paul, an alum of the JCDS class of 2015, built the five flowerbeds for Early Learning students to engage with nature. As a part of Art Specialist Alli Flores’ graduate school research, 5th grade students participated in a Sumi Ink Club event. “I am not choking,” the girl confidently read from a slim notebook as she balanced on a stool. There was just a hint of early adolescent attitude as she read the personal narrative about getting a cupcake caught in her throat and then really choking on it after she told her mom that she didn’t need help. Structured music lessons play an integral role in improving children’s cognitive skills and academic performance; that is what an abundance of developmental studies have shown. It seems that learning the “do-re-mis” has a significant, positive impact on mastering the ABCs — and beyond. JCDS has a continuous focus on a curriculum that respects individual strengths and challenges. With differentiated instruction, teachers use learning strategies and materials to meet various student needs. This moves classrooms away from a “one-size-fits-all” approach toward teaching that addresses the needs, strengths, and interests of each student in the class. Over the summer, teachers and administrators have been busy collaborating and are excited to share the following curriculum and instruction revisions. The changes were adopted to facilitate differentiated learning so students will continue to be challenged at their individual levels within a challenging curriculum that inspires inquiry and innovation. The Sharks soccer team won the 2018 NFISAC championship on May 11, overcoming St. Mark’s and San Jose Episcopal after going a goal down at the start of both games. 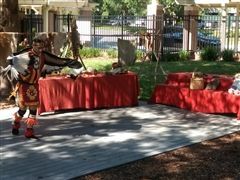 Our 3rd grade was "wowed" when Muskogee Creek tribe member Jim Sawgrass introduced the Native Americans' way of life recently. Mr. Sawgrass spoke about the Timucuans, the first people who lived in Jacksonville. On their own initiative and in honor of Earth Day, six 6th grade students set up lemonade stands in their neighborhoods to raise funds for environmental sustainability initiatives at JCDS. Ashton, Nina, Ellie, Izzy, Gray, and Lily recently raised a total of $502 for our school. 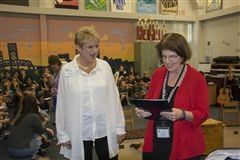 Virginia Dickert, a music specialist at JCDS for 23 years, was awarded the Gladys Prior Award for Career Teaching Excellence on April 18. She is one of fewer than 100 private and public school teachers in Duval County to have achieved this award. The awards are given to only four educators each year. It is no secret that JCDS has one of the best elementary Spanish programs in Jacksonville, with students as young as three learning the language. Spanish is the second most widely spoken language in terms of native speakers, so being able to communicate thoughtfully and effectively in Spanish is a useful skill. 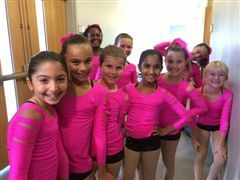 For over 20 years, the Greek Olympics has been one of the signature traditions for 6th grade students at Jacksonville Country Day School. 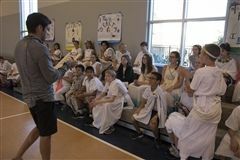 Dressed in togas and representing the city-states of Ancient Greece, students compete in field games such as relays and tug-of-war. This experiential learning activity helps what they have learned about ancient Greece to stay in their memory, in addition to promoting healthy activity and teamwork. How would it feel to be a dog or cat in a shelter? Fifth graders asked themselves this question earlier in the school year and they came up with ideas for items to make the lives of shelter animals better and more comfortable. 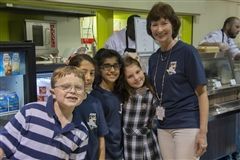 Innovation is embedded throughout the curriculum at Jacksonville Country Day School. The faculty and the administrative team are constantly looking at innovative ways to teach students. “I don’t think the fish should have googly eyes,” one boy said as a handful of 6th grade students pondered a plastic fish with a magnet on one side and a newly attached plastic eye on the other. 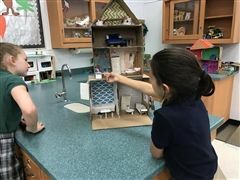 Third grade students recently made arcade games incorporating simple machines and using recycled materials such as cardboard. They had been studying simple machines in science class. Each arcade game included at least five simple machines, such as a lever or pulley. Fourth grade students have been learning about Latin America in their Spanish and Global Studies classes. As part of this integrated unit, they were asked to make something that would help to teach English to Spanish speakers in science class. 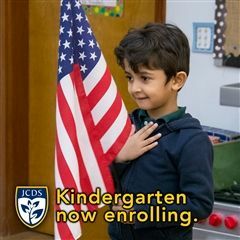 Jacksonville Country Day School (JCDS) students can communicate thoughtfully and effectively in more than one language. This was demonstrated at the recent 6th grade Hispanic Living Wax Museum. Sixth grade students dressed as famous Hispanic people they had researched and recited speeches in Spanish and in character to visitors to their station. Many of the students have been studying Spanish for over six years. 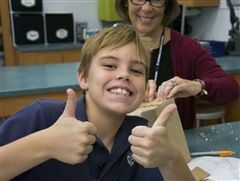 Jacksonville Country Day School students are excelling at their next academic levels. 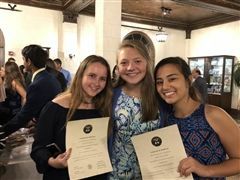 JCDS alums and current middle and high school students at The Bolles School are not only at the top of the class in academics but are also shinning in everything from the performing arts, with roles in the Bolles fall play, to STEM, as members of the Bolles Bots FIRST Lego Team. The faculty, staff, and administrative team of JCDS are proud of how well-prepared the school's alums are for success at their next academic levels. Fourth grade students have been conducting research for their Planet Panels project in library class. They spent the first few weeks of school discussing and practicing research. Specifically, they learned to use the FINDS research method. In my Pre-K 4 class recently, some boys began rolling cylinder blocks under tunnels in the block center and it reminded me of marble runs. The following day, I asked three students if they would like to create a marble run for the class. All three were excited to undertake the project. 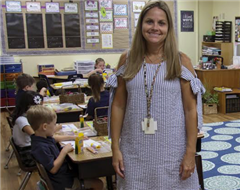 With so many parents active on the Jacksonville Country Day School (JCDS) campus, it can be difficult sometimes to tell who are the parents and who are the teachers. From helping out in the classroom to the lunchroom, parents are involved in all aspects of campus life. 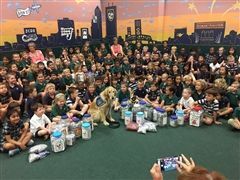 Students at Jacksonville Country Day (JCDS) collected supplies that will be shipped to Puerto Rico to help people on the island impacted by Hurricane Maria. 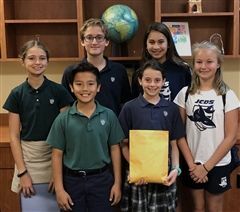 The students at the Jacksonville, FL private school collected 2 and 1/2 vanloads of supplies donated by JCDS families, faculty, and staff to the island’s relief efforts. 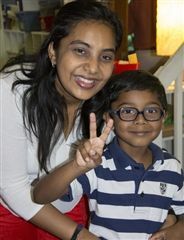 From as young as 3 years old, students at JCDS learn to serve the community. This is reinforced at every age, as service learning is integrated throughout the curriculum. 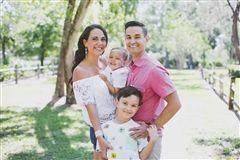 When talking with Christa E., proud mom of a 2-year-old little girl, who attended Mini-Moments at Jacksonville Country Day School last year, she shared some of her thoughts and experiences. 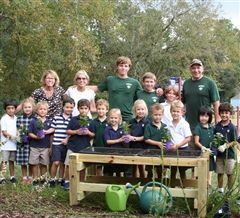 Jacksonville Country Day School has been chosen as a grant winner of the Florida Wildflower Foundation’s 2017 Seedlings for Schools program. In September, JCDS will plant a wildflower garden as part of a new Outdoor LearningScape at the school. 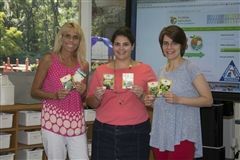 An assortment of 12-15 native wildflowers will be chosen specifically for the school’s northeast region of Florida. Jacksonville Country Day School 5th grade students recently held their STEM Expo in the new Shark Lab's makerspace. Students proudly shared two projects with parents: one involved electric circuits and the other showcased innovations based on the future of activities that originated in Europe, such as tennis and painting. It wasn’t Tom Sawyer’s friends whitewashing a fence in St. Augustine on Saturday; it was members of the faculty and staff of Jacksonville Country Day School (JCDS). The JCDS team members recently dedicated a sunny Saturday to painting a fence and porch decking on a home near downtown St. Augustine. 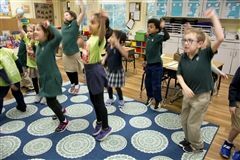 The 5-year-old students take a series of deep breaths – focusing on breathing in deeply as they pull their arms in and exhaling as they release their arms forward. This exercise helps bring the students “into the moment” before they begin the day’s lessons. This focus on breathing has been shown to lessen stress and anxiety in the classroom, which leads to better academic outcomes. 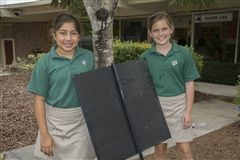 Fourth graders at Jacksonville Country Day School were recently challenged to create an invention to help Latin American children learn English. It couldn’t just be an idea; the concept had to be something that they could make using the tools in the makerspace. What Does Character Education Look Like at JCDS? 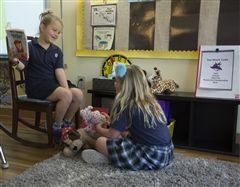 Many of you know that character education is a key focus at Jacksonville Country Day School. Some of you, however, have probably wondered what the character education program consists of. 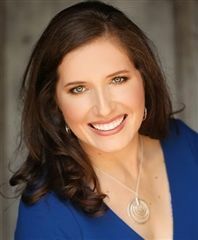 School Counselor Amanda Sheroff has compiled a list of the main components of the program to share with you. 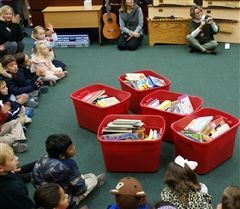 Early Learning students at Jacksonville Country Day School (JCDS) donated five big red tubs of books to Books-A-Go Go on December 9. The Pre-K 3 through Kindergarten students collected the new and gently used children’s book so that other children in Jacksonville may have books of their own. Swimming With The (JCDS) Sharks! 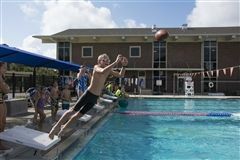 Not many elementary schools have swimming skill development programs — or even pools. Jacksonville Country Day School is one exception. The science and computer labs went through a transformation over the summer — and so did the science, technology, engineering, and math (STEM) curriculum at JCDS. 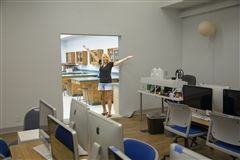 The science and computer labs have been combined and renamed the STEM Shark Lab and Tech Studio. This integration will also be reflected in an enhanced curriculum, which breaks down the barriers between STEM disciplines. Parents experience a wide range of emotions when sending their child off to school for the first time. This milestone is a time of great excitement and joy, but starting school can also be full of anxiety and apprehension for both parent and child. Here are some tips for an easy transition into your child’s first year of school. 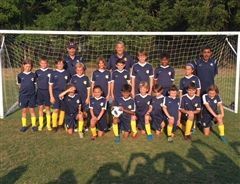 Our experienced admissions team shares some things to consider when evaluating prospective Jacksonville private schools for your children. 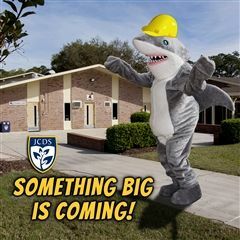 Sharky serves as the mascot for Jacksonville Country Day School. In this post, Sharky answers some questions and shares some of its favorite things. 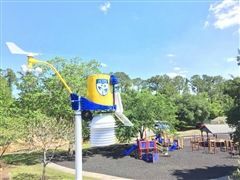 Jacksonville Country Day School, a private school on the Southside, is excited to announce that a WeatherSTEM system has been installed on its campus. The WeatherSTEM combines data from scientific instruments and sensors with STEM curriculum. This live, hyper-local data will be used to energize lessons in science, technology, engineering, and math (STEM) at Jacksonville Country Day. The system also provides current in-depth weather information for the area around the Southside school through a dedicated website. 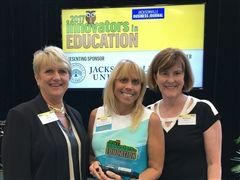 JCDS Named a "Best Place to Work"
Jacksonville Country Day School is proud to announce that we have been named to the 2016 list of Best Places to Work by the Jacksonville Business Journal. The student council at Jacksonville Country Day School (JCDS) raised over $700 for charity on a recent “break the dress code” day. JCDS student council members used these funds at Target to pick out socks for patients at Wolfson Children's Hospital. They also assembled 50 "Art to Go" bags to give to Art With A Heart in Healthcare at Wolfson, which will give the bags to patients in the program. 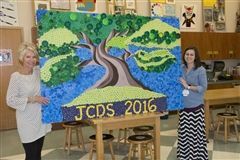 Students at Jacksonville Country Day School (JCDS) recently completed an art project that will hang in the office of UF Health Jacksonville. Made of recycled plastic pharmaceutical bottle caps, this relief image of a tree has been years in the making. 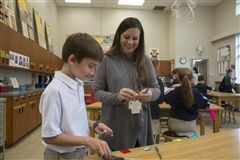 Over the last two years, JCDS students of all ages have worked on the project in the Jacksonville private school’s main art room. Connecting the arts with other academic disciplines helps to unleash young minds. 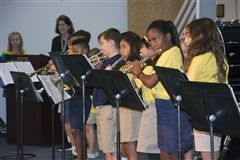 Arts integration truly deepens learning experiences in the core academic subjects. 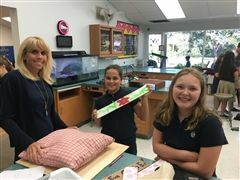 FutureTech, a new 6th grade elective, teaches students the basics of design thinking and other 21st century skills such as collaboration and problem solving. In this elective, students work in teams to design a technological solution to a problem. They sketch out, design, create, test, and print their projects in three dimensions, and then watch their ideas come to life in front of their eyes. The sun hasn’t risen above the leafy Southside campus as a lone shadow darts among the foliage. It is 3rd grade associate teacher Teresa Gore, and she comes in early almost every morning because she is so excited to teach. 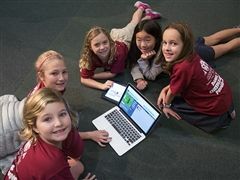 Students at Jacksonville Country Day School (JCDS) recently participated in the “Hour of Code.” The Hour of Code is a global movement to get students interested in computer programming. According to Code.org, almost 150 million students in over 180 countries have tried the Hour of Code since the program’s launch in 2013. Most schools teach different subjects in isolation. Math teachers don't know what children are learning in science class and vice versa. Students move from subject to subject but typically there is no integration. 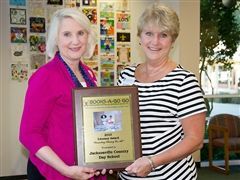 Jacksonville Country Day School (JCDS) was one of two recipients of Books-A-Go Go’s Literacy Award. The award recognizes organizations that have made a significant contribution to Books-A-Go Go’s mission of providing low-income children with gently used to new books. “Books-A-Go Go would not exist if it weren't for JCDS,” Betty Metz, the organization’s president said. Sixth grade students are wrapping up an immersive, integrated learning global studies unit on Africa. This connected learning experience combined geography, literacy, math, music, research, and service leaning. Walk into any elementary school at 4:45 p.m. on a Monday afternoon and you’d expect to find nothing going on besides a few straggling faculty heading to their cars. 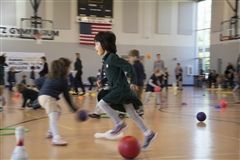 Walk into Jacksonville Country Day School’s campus at that time and you’ll find an array of activities and students engaged in a variety of options.